Method: Preheat the oven to 180°C and roast the almonds on a baking sheet until a dark golden brown, about 6 – 8 minutes. If the almonds are not crisp all the way through they will become soggy in the ice cream. Remove from the oven and set aside to cool. Meanwhile cut the marshmallows into 1.5cm cubes. Chop the chocolate roughly and melt over simmering water – do not overheat. Meanwhile line a plastic tray 25cm x 15cm with non-stick baking paper. Sprinkle a layer of marshmallows and almonds on to the tray. Drizzle heavily with the chocolate. Repeat this process until you have used all the ingredients. You should aim for a rocky road that is about 2.5cm thick. Refrigerate for about 20 minutes and break into medium sized pieces. Puree the raspberries and pass through a coarse sieve to ensure that there are no lumps of fruit. 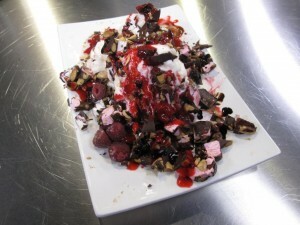 Stir the puree into the softened ice cream and add the liqueur and pieces of rocky road, stirring gently as you go. Freeze in the refrigerator till firm. To serve, garnish with raspberries and bits of rocky road and serve on a pool of chocolate sauce.